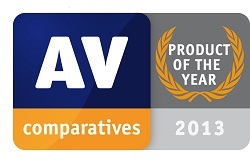 Kaspersky Internet Security received the “Product of the Year” award from the independent test lab AV-Comparatives after it consistently demonstrated the best results in testing throughout 2013. Out of 22 participating products, Kaspersky Lab's solution was the only one to achieve the top Advanced+ ranking in all tests.Kaspersky Lab announces that Kaspersky Internet Security, its flagship home user product, has received the “Product of the year” award from the independent testing lab AV-Comparatives after it consistently demonstrated the best results in testing throughout 2013. Out of 22 participating products, Kaspersky Lab's solution was the only one to achieve the top Advanced+ ranking in all of the tests.